Apple has always been proud of the fact that it’s an American company and more specifically, a major force in the growth of Silicon Valley that for decades has been and still remains the EPICENTER of all things tech. This ad helps reinforce the idea that Silicon Valley is not going away and in fact will continue to be a major tech design center well into the future. and it’s not only the design made by Apple’s Industrial Design Group (IDg), it’s everything, hardware, operating systems, software, and services. Many big companies are diversified and cover lots of completely different markets. Apple doesn’t, the company focusses on a straightforward set of products and services with a clearly defined target: Bring it all together. Following Steve Jobs and Tim Cooks philosophy to offer the best products it’s obvious that product design also has to be outstanding. No other company presents it’s products on their websites like Apple. See these high-resolution images of the new iPhone 5S which show quality, simplicity, durability, and functionality. And btw, other companies shouldn’t do this because of a much lower quality of materials and in many cases a simple product design which lures nobody into the cinemas. The key to high-quality design is a simple shape, the interaction of shape and material, the avoidance of bells and whistles, and a strong focus on functionality to seamlessly use the product. 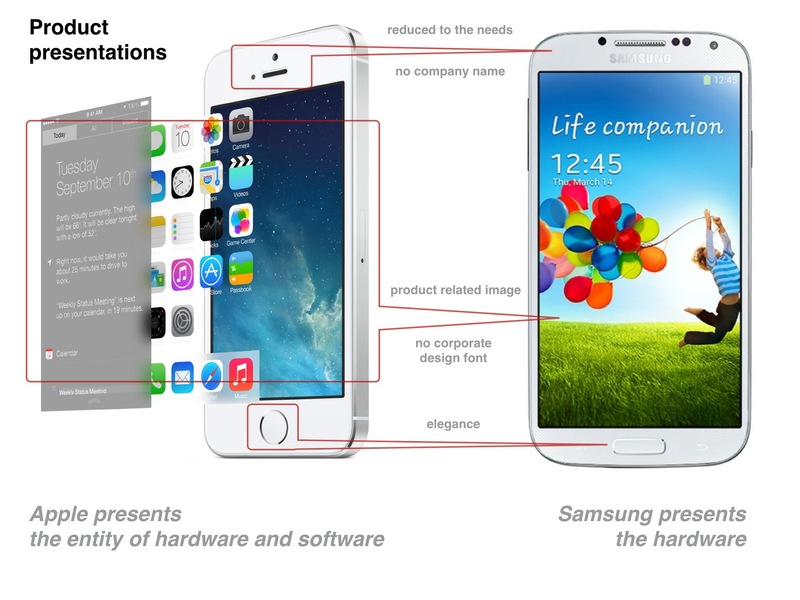 See this comparison of Apple’s and Samsung’s website both presenting their flagships for the smartphone market. A more detailed view on a single product shows the differences between hardware and entity oriented ad. Samsung manufactures hardware but gets the operating system from Google. So it’s ad focusses just on the hardware not mentioning the Android operating system but placing a photo on the screen with no relation to the product. 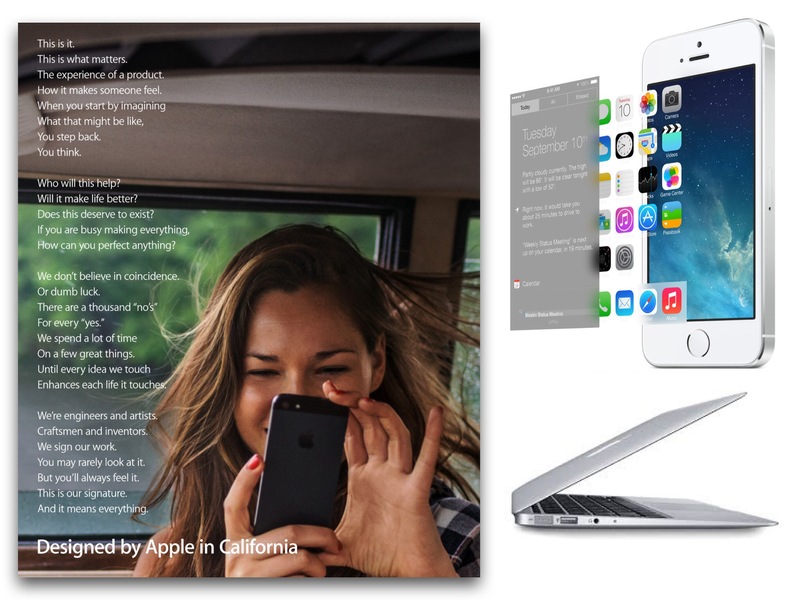 A more detailed view on the website of Apple where we can see a choreography of product images with well-worded subtitles. And there’s more. Searching for images of Samsung devices as high-resolution images on Samsung’s website was unsuccessful. Maybe it’s why these kind of images would show the lacks in product quality. 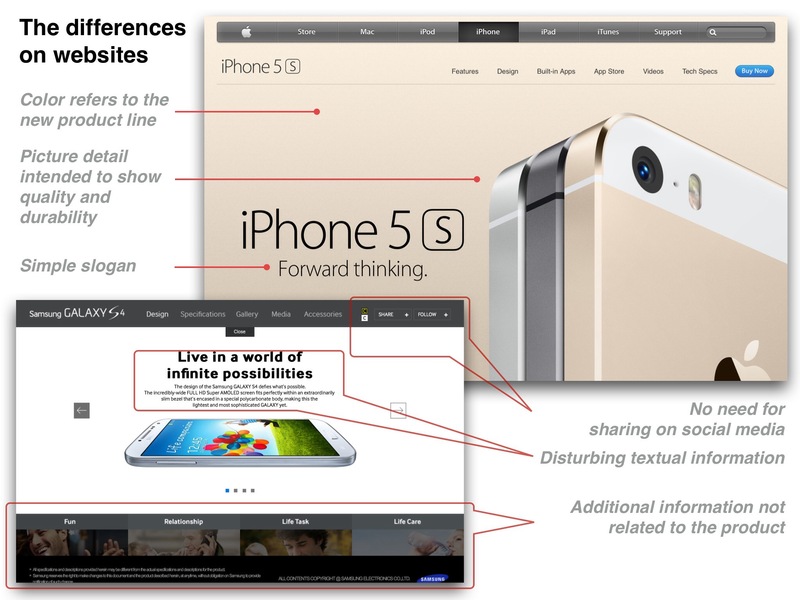 What we find when analyzing Apple’s websites are basic principles of web design. Notice how “hot” areas abrupt in the middle of sentences. This is typical for the scanning process. Web users are impatient and insist on instant gratification. Very simple principle: If a web-site isn’t able to meet users’ expectations, then designer failed to get his job done properly and the company looses money. The higher is the cognitive load and the less intuitive is the navigation, the more willing are users to leave the web-site and search for alternatives. 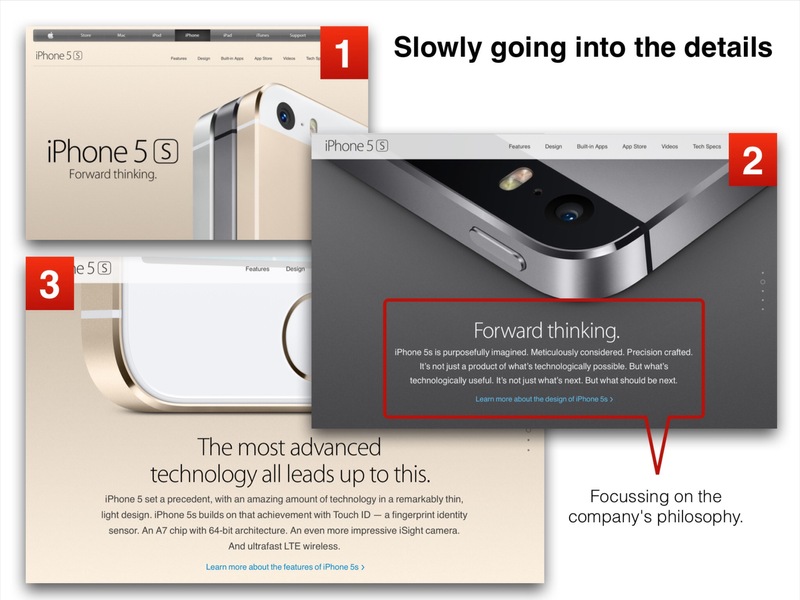 Apple reduces the information load to a minimum and focusses on presenting the product. The surfer’s eye is completely focussed on the product. Users don’t search for the quickest way to find the information they’re looking for. They don’t scan websites in a linear way. They choose the first reasonable option. As soon as they find a link that seems like it might lead to the goal, there is a very good chance that it will be immediately clicked. 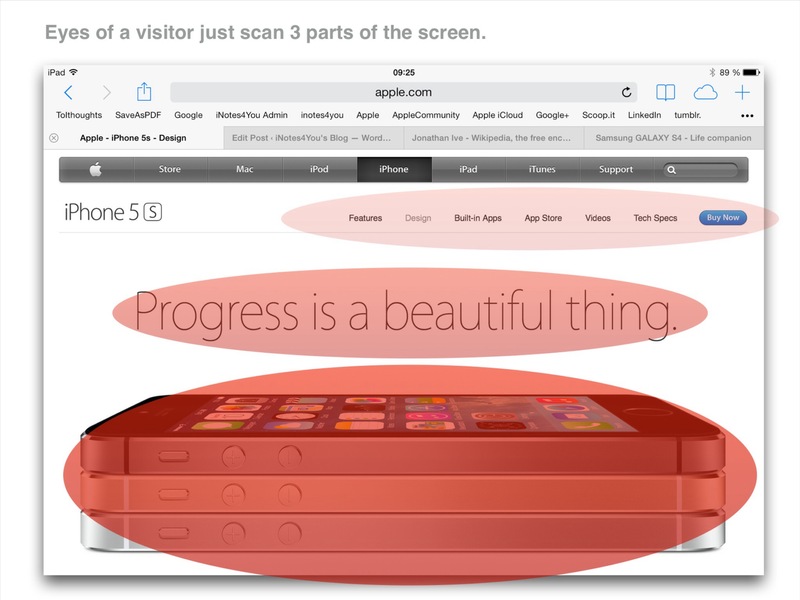 Apple’s website smoothly brings the visitor from eye-catchers to the technical details. Apple also supports that their DNA moves over to developers. 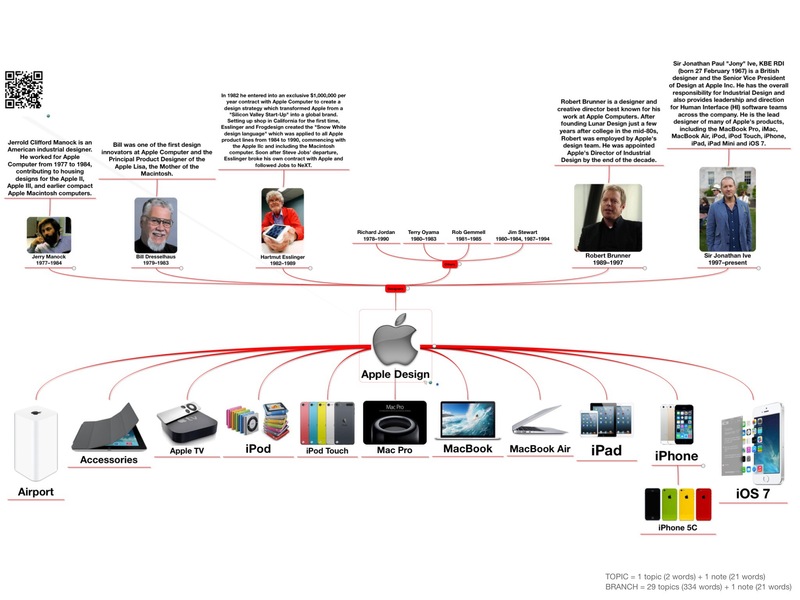 This mind map summarizes some facts, design highlights, and the engineers standing behind Apple’s design philosophy. Apple’s design is fully integrated in the company’s strategy and without bells and whistles. The focus is just on creativity, innovation, and producing cutting-edge technology.